The marlin mural is decorated and fired ( 3X ) It came out great except it is a lot too dark for the customer. I am in the process of making another one. If you would like to own this one please contact me to make arrangements. I will be setting it on wood to hang up. 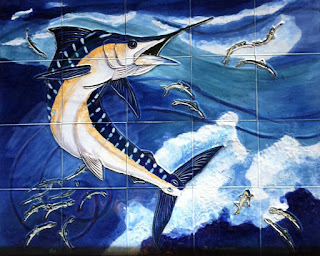 Let's talk soon, I'll keep you posted on the progress of the second Marlin Mural.